Churchill’s 1940s Party was a collaborative Murder Mystery event produced, written and organised by Shoreline Theatre, Swansea University Students’ Union, Choral Society, Musicians’ Society, Dance Society and the History Society. 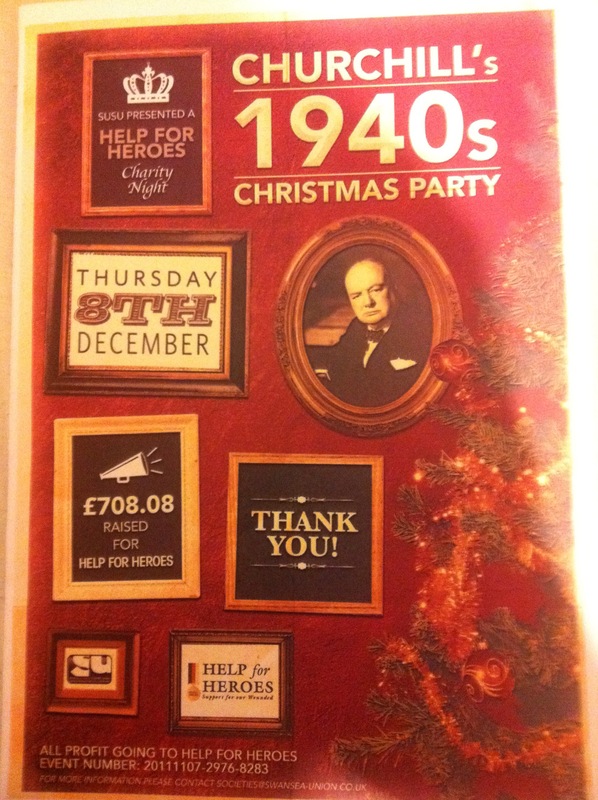 It was organised to raise money and awareness for the charity Help for Heroesfor which it raised a staggering £708.08. It was co-written and produced by Steven Hirst, Lucas Smith, Tom Upton (Societies and Services Officer), Rosie Hunnam (Societies and Student Development Co-Ordinator), Sarah Carr (President, Choral Society), Martha Kiff (President, Musicians’ Society), Sam Woollcott (Musicians’ Society), Fionnuala McKenna (President, Dance Society), and Natasha Oldham (Dance Society). It was organised as a themed party in Oceana on December 8th 2011, with the Murder Mystery element remaining a surprise. Tickets were sold on a very limited basis. The acting element was directed by Steven Hirst and Lucas Smith whereas the technical aspects were handled by Tom Upton. As the brass band played old Glen Miller hits, and the Dance Society danced an elegant swing routine, an air raid was simulated with smoke machines, lighting and sound effects. Following the air raid, it was discovered that the drummer had been killed. Theo Paddington – A disillusioned anti-war theatre director who lost some very close friends at Dunkirk and blamed Churchill. Lady Battenberg – A jilted ex-lover of Churchill’s. She carried around a pill-box that was later identified to be carrying anti-depressants to deal with her unstability. Colonel Dijon – A decorated military officer who led his troops to ruin in WW1 and had just lost his only son in WW2. He had turned to alcohol for solace and become prone to domestic violence. Dylan Thomas – An unpredictable drunk with a penchant for poetry. He recently wrote a very moving poem to Churchill to be used as morale booster for the war effort. It was magnificently snubbed and never seen (or heard about) since. Mrs Dijon – Colonel Dijon’s wife. Has been dealing with the fallout from her husband’s disastrous military career for years and has recently lost a son in WW2. Through a number of plot twists and hilarious reveals, the night concluded with the party wrongly accusing Lady Battenberg of plotting the murder of Churchill. After Battenberg runs away in tears, Colonel Dijon seizes on the opportunity to produce a gun to finish the job he had tried to start with the poisoned drink. However, another guest, Brigadier-General Monroe is on hand to stop Dijon before he can fire and the party continued unimpeded. Dancers: Fionnuala McKenna, Natasha Oldham, Alice Simpkin, Lisa Hussein, Charlie Ajomale, Mathew Jones, Owen Watts. Publicity was by word-of-mouth and discreet 1940s-style posters distributed around campus, In order to create an authentic feel, use of facebook and internet was limited. The first part of the publicity campaign involved Fred Cooper (President, Comedy Society) conducting a radio broadcast from the balcony of Fulton House using 1940s style radio equipment. The final part of the publicity was a “BBC Broadcast” announcement of Churchill’s Christmas party by two reporters, played by Steven Hirst and Lucas Smith.